Math puzzles is a series of games for educational purposes where you as a player are solving mathematical problems in given time. The goal is to solve math equations starting from 2 linear equations with 2 variables up to 5 linear equations with 5 variables. Try to solve as many as you can and reach the highest levels. If you are in to solving math problems you can test yourself by playing this puzzle game with 50 tasks, and see how successfull can you be. 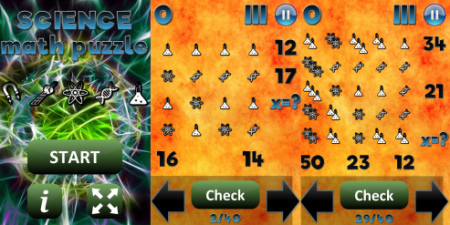 If you consider yourself an expert in math, this is the game for you. It takes skills and methodology to solve all 40 tasks in front of you. 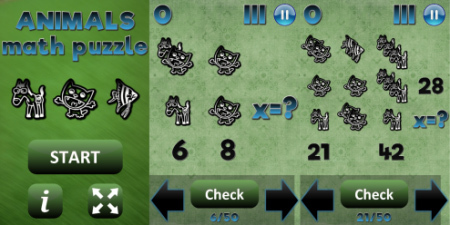 Animals and Science math puzzles are mathematical games with goal to solve 50 (Animals) or 40 (Science) different mathematical problems all in limited time per task. Tasks are created as linear equations with 2 and 3 variables (Animals) or 4 and 5 variables (Science). When you start the game start screen will show first task for you to solve. In upper left corner you can track your current score. On the right side there is a mark of remaining attempts that depletes per one each time you miss, and at the right end, there is a pause button for you to use. At the bottom of the screen a counter is showing available time per task and current level. What you need to do is to find the value for the (x). (x) is a sum of the picture mark values within the (x) row. To get to (x) you need to designate a value to each picture mark according to values shown per row or column. For Animals (level 6 – see middle slide of Animals picture above): you need to find both values for the cat and the horse since 1 horse + 1 cat gives you an (x). You can conclude that the value for the cat is 4 since value for entire second column with 2 cats is 8 (8/2=4). Now, knowing the cat is 4 and entire first row consisting of 1 cat and 2 horses is 6, you can conclude that the value for the horse should be 1 (6-4=2 and 2/2=1) which gives you the overall (x) result (1+4)=5. For Science (level 2 – see middle slide of Science picture above): you need to find both values for the atom and the chemical container since 1 atom + 3 chemical containers gives you an (x). You can conclude that the value for the chemical container is 3 since value for entire first row with 4 chemical containers is 12 (12/4=3). Now, knowing the chemical container is 3 and entire first column consisting of 2 chemical containers and 2 atoms is 16, you can conclude that the value for the atom should be 5 (16-(2x3))=10 and 10/2=5) which gives you the overall (x) result ((3x3)+5)=14. You can input your result by pressing the buttons to raise or lower desired value and verify your result by selecting the button. Solving the problem gives you 30 seconds of additional time (up to max. 90 seconds). If you miss you will loose one of the three attempts that you have per game. If you are running out of time you can pause the game to give you some time to conclude the right solution. Game is completed when you finish all 50 levels (Animals) or 40 levels (Science). If you run out of time or you use all available attempts not getting the equation true, the game is over. In any case a final screen will show your achieved score and hi-score from previous playing to compare. Each time you successfully finish 10 levels (Animals) or 8 levels (Science) you earn a star to track/show your skill.